Since my last post, I cannot remember one evening that I have not returned to my room after supper with a huge smile on my face / with a dull ache in my stomach from laughing too much. The children (and Sr Pasqua I might add!) are born entertainers and on a number of evenings the Sisters have called them into the refectory after supper to sing and dance for us, on one occasion of which I was presented with yet another heart shaped cake and a gift from the children which turned out to be a florescent green shirt and trouser suit with zebras on it. I wore the shirt to mass the following Sunday and bearing in mind green really isn’t my colour and that I wore it with a brown skirt so looked a bit like a tree, everyone was very complimentary. All of the children love to sing but there is one child in particular whose voice you can always hear wherever you go. His name is Majoki, he is 12 years old and he has one of those smiles that literally lights up a room. He has started writing his own songs and asks to come and sing them to us most evenings – my favourite so far is a song called ‘Don’t drink alcohol’ (which turned out to be quite difficult to keep a straight face to whilst holding a large glass of vino!). Since the first glass of red wine appeared there has been many more…along with a couple of large doses of Amarulla. If you ever need an excuse to have a cheeky tipple, Sr Pasqua has a few good ones up her sleeve that you can try – ‘My doctor told me to drink alcohol because of my blood pressure’, ‘It’s good for digestion’ or ‘It cleanses the palette’ to name just a few. Obviously I’m more than happy to accept all three. Along with tasting the local wine, yesterday I also braved one of the local delicacies, particularly common at this time of year – fried grasshoppers! On seeing my reaction to finding out that they eat them Sr Pasqua immediately rang one of her fellow Sisters who was in Kampala at the time to ask her to bring some back for us. Two days later I arrived at supper and found a small packet waiting for me which could almost have been mistaken for a take away box – imagine my dismay to open it and find it packed to the brim with fried grasshoppers. The silver lining to this story is that they had already removed the legs. So I shut my eyes and went for it – and then I had another! Not sure I’ll be going back for a third but to be honest, it wasn’t all that bad! I am growing fonder of the children as each day passes. Sr Pasqua has dutifully noted the ones that I seem to spend a lot of time in particular with and now refers to them as my very own offspring so Mum and Dad, you will be happy to hear you are now grandparents to four beautiful children – Majoki, Patience, Sandy and Sam. Of course, despite the smiles and laughter that fills the home every day, each child here has a story and over the past few weeks, bit by bit I have been learning about these children’s pasts and how they came to be at Redeemer. It does not even bear thinking about where these children would be without the dedication of the wonderful Sacred Heart Sisters and their on-going hard work and commitment. The hardest stories to hear are those of the children abducted by the rebels of the LRA back in 2003 when the home was located at the other side of the Nile, in Adjumani district. Some of the children escaped or were rescued from the rebels in the years that followed and returned to the new Redeemer home constructed in the safer region of Moyo. However, sadly some were killed and for others, it is still unknown to this day what happened to them. For those that returned, the majority were severely traumatised by their experiences and it has taken many years for the memories to fade. The other day I took an evening stroll to collect something from the babies’ home with a lovely girl called Victoria who was kept by the rebels for two years before she was returned to the home in 2006. Sr Pasqua showed me a photo of her that they took the day she returned and I honestly would not have recognised her as the same girl. She returned stick thin, malnourished, traumatised and with severe burns all over her back from where the rebels had burnt her with swords straight from the fire. She is a very bright girl and after years of counselling she was much improved, doing very well in her studies and was elected head girl at Moyo Girls Primary School. She has just finished Senior 4 and is currently deciding between going on to study nursing or training to become a counsellor. This is one of the happy endings. Of course most of the children abducted are now grown up and moving on with their lives. The younger children and more recent additions to the Redeemer family also all have their own stories, every single one of which makes me more grateful for my own upbringing and privileged childhood – but I will leave those for another day. On a slightly more upbeat note, yesterday I more or less became a celebrity here in Moyo after a brief visit to the local radio station, TBS. The manager, Joseph, is one of my good friends and invited Vuni and I to come and visit him at the station. He showed me around and then before I knew it I was stood in front of a microphone recording some promotional clips for them to play in between tracks. Joseph also hosts the classical show in the morning called ‘Coolzone’ so he insisted that I record one especially for him which was along the lines of ‘I like Coolzone on TBS – it’s classic!’. I told the Sisters today so they said they would listen out for my voice. I think I might start practicing my autograph. So yet again, my brief weekly update has somehow turned into a rather epic blog post so I think it is about time I call it a day. Tune in next week when I will report on my final days here in magnificent Moyo. 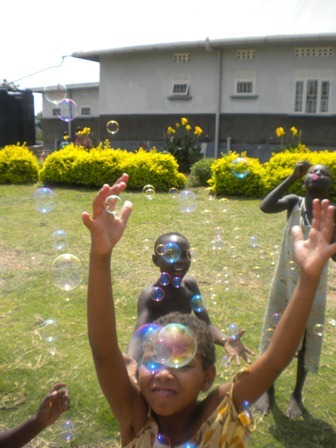 Read more about Moyo Babies Home.